Plot Summary: In the near future Emotional Transference is the drug of choice. Garrick is a Drone, going to ever-increasing extremes in order to sell the emotions. But he does it for a reason—because some memories are just too painful to bear. When his dealer is murdered, Garrick must search for a new way to remove his unwanted emotions, but soon finds himself embroiled in a plot that threatens to go deeper than he ever imagined. Between terrorists bent on preserving the inner space, assassins with a debt to pay, and a social media giant with its claws in the government, can Garrick survive long enough to uncover the truth and let the world know? This is one of those fast paced books where the action almost never lets up, and you can't put it down until you're done. Thankfully, it's a short read and a very entertaining one at that. 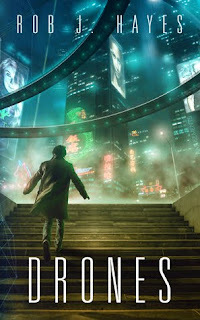 I was drawn in by the concept of Drones. Emotional Transference is an intriguing idea, and selling emotions...well, personally, I'd have a lot to offer. Anyone up for some anxiety? Garrick is a well developed character, flawed, selfish, hurt, and despite all of Garrick's flaws, Hayes managed to make me care for him. The world building is minimal, only what's necessary to tell the story. Told in first person and present tense, the writing style is perfect for the pace of this book. The reader is right there in the moment with Garrick, giving it a thrilling sense of immediacy. The author could have explored the premise a bit more. The consequences of transferring emotions, the ethical side of it etc. He does so only superficially, but that hasn't actually bothered me because this book is simply about Garrick. And Garrick is in a lot of pain, and now in a lot of trouble. If you're a fan of sci-fi/cyberpunk and find the premise interesting, this book will not disappoint. At only about two-hundred pages, it's the perfect alternative to an action film. I really love the idea behind this one. Sci-fi can sometimes drag for me, but it sounds like this one is a real nail-biter! You read genres that I love so much! Sci-fi, cyberpunk sounds so good to me. I love when the action and everything is intense, so you have to sit down and read the book from start to finish.